To start with, scientists have a pretty good understanding of what the Earth's climate has been throughout its history, why it has changed over time and what specific factors have caused the climate to change. In truth, the only factor that fully explains all the changes we can see and measure in temperatures, ocean salinity, atmospheric composition, loss of Arctic sea ice volume, and species habitats & ranges is due to the warming from human-derived fossil fuel, mainly CO2, that we have put back into the carbon cycle. We have accurate, reliable data for the growth of atmospheric CO2 and for anthropogenic emissions (for details, see Cawley, 2011). The fact that the net natural flux is negative clearly shows that natural uptake has exceeded natural emissions every year for the last fifty years at least, and hence has been opposing, rather than causing the observed rise in atmospheric CO2. It is true that the fluxes between the oceans and atmosphere depend on temperature, so all things being equal, one would expect atmospheric CO2 to rise in a warming world. However, the thing the fake-skeptics normally ignore is that CO2 solubility increases with increasing difference in the partial pressures of CO2 between atmosphere and surface waters. In the real world, all things are not equal, our emissions have caused a difference in partial pressures, which is increasing the oceanic uptake, which more than compensates for the temperature driven change in fluxes. The human-caused (anthropogenic) origin of the measured increase in atmospheric concentrations of CO2 is a cornerstone of predictions of future temperature rises. As such, it has come under frequent attack by people who challenge the science of global warming. One thing noteworthy about those attacks is that the full range of evidence supporting the anthropogenic nature of the CO2 increase seems to slip from sight. So what is the full range of supporting evidence? 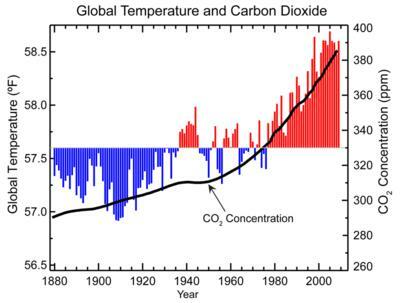 The current, and ongoing, increase in atmospheric carbon dioxide concentration is due to human industrial activities. In scientific circles this is the climatological equivalent of the Earth being round - a fact so plainly obvious and supported by such a vast body of scientific evidence that to question its reality is absurd. It quickly becomes clear that it is the humans who have caused the rise in CO2 levels, by burning fossil fuels in the twentieth century. Every other hypothesis makes a host of predictions that do not pass the test of the evidence.